The Tanzania Field Station (hereinafter TFS) is located in a residential area in the suburbs of Dar es Salaam. The Field Station serves, in cooperation with Sokoine University of Agriculture, as a base for research, a seminar venue and a place for organizing and storing materials. In FY2004, four graduate students of the Kyoto University Graduate School of Asian and African Area Studies (ASAFAS) were dispatched with subsidies from the 21st Century COE Program to conduct investigations and researches based at the TFS. Four ASAFAS members dispatched under non-COE programs conducted on-site education for 12 students including the above-mentioned four as well as eight additional ASAFAS graduate students and research fellows, whose trips were funded by non-COE sources. In addition to the ASAFAS members and graduate students, the Tanzania FS is widely used by faculty members and graduate students of other institutions including the Kyoto University Graduate School of Agriculture, Graduate School of Science and Graduate School of Global Environmental Studies, Tokyo Institute of Technology, Fukui Prefectural University and Tokyo University of Foreign Studies, and the utilization of the TFS exceeded a total of 300 man-days during the year. IKENO Jun (ASAFAS faculty member) visited Tanzania from July 24 - September 5, 2004, subsidized by Grant-in-Aid for Scientific Research. He carried out fieldwork on "An Empirical Study on Regional Socio-economic Complexes surrounding Coffee Production Areas in East Africa" and also conducted on-site education for MIZOUCHI Yoshiyuki, ASAFAS graduate student (enrolled in FY2003), who was conducting a survey in the Kilimanjaro Region. IKENO also held consultations toward joint research with the University of Dar es Salaam. KAKEYA Makoto (ASAFAS faculty member), ITANI Juichi (ASAFAS faculty member) and ARAKI Minako (ASAFAS faculty member) visited Tanzania with subsidies from Grant-in-Aid for Scientific Research for the periods of July 28 - September 1, 2004, July 14 - September 15, 2004 and July 24 - September 5, respectively, and undertook field research for "Integrated Research on African Way of Rural Development Based on Area Studies," and carried out on-site education for KATO Futoshi (enrolled in FY2002), YATSUKA Haruna (enrolled in FY2003) and KANDA Yasunori (enrolled in FY2004). They also held consultations about joint researches at the SUA Centre for Sustainable Rural Development. 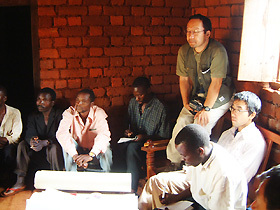 ITANI Juichi visited Tanzania from October 16 to December 3, 2004, with subsidies from Grant-in-Aid for Scientific Research, and carried out an on-site investigation together with David G. Mhando (enrolled as a third year student in FY2002), KUROSAKI Ryugo (enrolled in FY2000) and KANDA Yasunori. IKENO Jun visited Tanzania from November 4 - 26, 2004, with subsidies from Grant-in-Aid for Scientific Research, and through a survey on rural socio-economic change in Pare, conducted on-site education for MATSUURA Shinano (enrolled in FY2004). MHANDO, David Gongwe; April 1 - 24, 2004; 21st Century COE Program; Tanzania; "Farmer's Coping Strategies under the Changes of Coffee Marketing System after Economic Liberalization :The Case of Mbinga District, Tanzania"
OGAWA Sayaka (enrolled in FY2000); April 1 - July 25, 2004; 21st Century COE Program; Tanzania; "Study on the Transformation of the Urban Small-Scale Commercial Sector after Economic Liberalization in Tanzania"
MHANDO, David Gongwe; October 16 - November 15, 2004; private financing; Tanzania, "Farmer's Coping Strategies under the Changes of Coffee Marketing System after Economic Liberalization :The Case of Mbinga District, Tanzania"
KATO Futoshi; April 1 - August 14, 2004; private financing; Tanzania; "Ecology and Management of Rice Cultivation in Rain-Fed Paddy Fields in the Kilombero Floodplain of Tanzania"
OGAWA Sayaka; Januaryl 19 - March 31, 2005; 21st Century COE Program; Tanzania; "Study on the Transformation of the Urban Small-Scale Commercial Sector after Economic Liberalization in Tanzania"
MIZOUCHI Yoshiyuki; April 1 - October 17, 2004; private financing; Tanzania; "Migration Pattern in Kilimanjaro, Tanzania: With special references to Its Socio-economic backgrounds and recent change in Rural-urban Relations"
KAWANISHI Yoichi (enrolled in FY2002); April 1 - July 11, 2004; private financing; Tanzania; "Production and Trading of Black- wood Carvings in Tanzania"
YATSUKA Haruna; July 11 - December 26, 2004; private financing; Tanzania; "A Study on Environmental Utilization by the Sandawe"
KANDA Yasunori; July 28 - March 31, 2004; private financing; Tanzania; "The spreading process of paddy cultivation and coexistence of the Wanda and the Sukuma peoples in the semi-arid area of Tanzania: A case study of Usoche village, Mbozi district"
MATSUURA Shinano; November 3 - 24, 2004; Private financing; Tanzania; "Rural Socio-economic Changes in North Pare Mountains, Mwanga District, Tanzania"
KUROSAKI Ryugo; October 16 - December 16; 21st Century COE Program; Tanzania; "Rural Development and the Response of Communities in Southern Tanzania"
KONDO Fumi (enrolled in FY1999); January 2 - March 25, 2004; 21st Century COE Program; Tanzania; "Agro-Ecological Study on the Development of Indigenous Cropping System in the Southern Highlands of Tanzania"
IWAI Yukino (PD JSPS research fellow); February 19 - March 18, 2005; Grant-in-Aid for Scientific Research subsidy; Tanzania; "Co-Existence between Wildlife and Communities in Serengeti, Tanzania "
MARUO Satoshi (PD JSPS research fellow); January 9 - March 14, 2005; Grant-in-Aid for Scientific Research subsidy; Tanzania; "Changes of a Rural Community with Relation to Local Trade of Cooking Bananas: Haya, Northwestern Tanzania"
With the improvement and enhancement of the research equipments in the TFS, the system is ready for the "data analysis and review of research direction within fieldwork". However, the costs for security measures, communication, utilities, hygiene, etc. are borne by the users, and long-staying researchers in fact have to bear a heavy financial burden. The TFS is planning to hire a Research Fellow of the 21st Century COE Program in FY2005 to further improve the management, operation and education/research systems and to enable it to function as a base of joint researches in East African countries by enhancing its network with other field stations. The education and research activities of the TFS are implemented in cooperation with members in Sokoine University of Agriculture, which has concluded an agreement for collaboration with Center for African Area Studies, Kyoto University. Joint researches are conducted in close cooperation with the 21COE Program, the research team titled "Integrated Research on African Way of Rural Development Based on Area Studies," subsidized by Grant-in-Aid for Scientific Research and the Centre for Sustainable Rural Development, Sokoine University of Agriculture.